With no school this week, we've taken the kids skating a few days in a row. How fun to see the improvement each day. 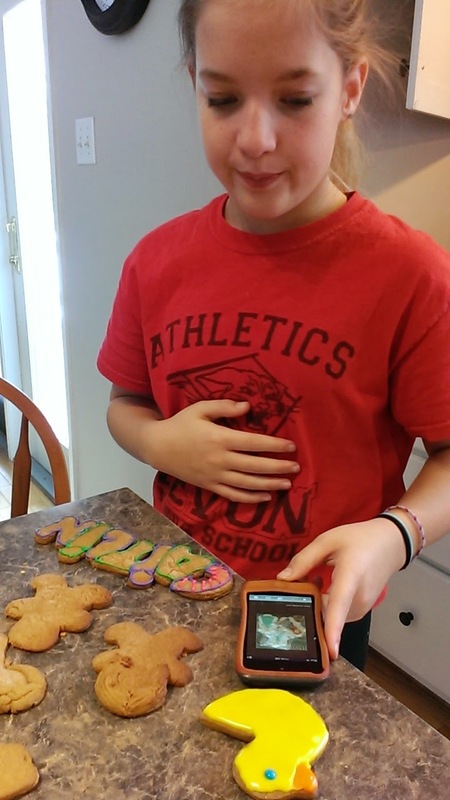 And even more fun to come home and have hot chocolate and cupcakes after. 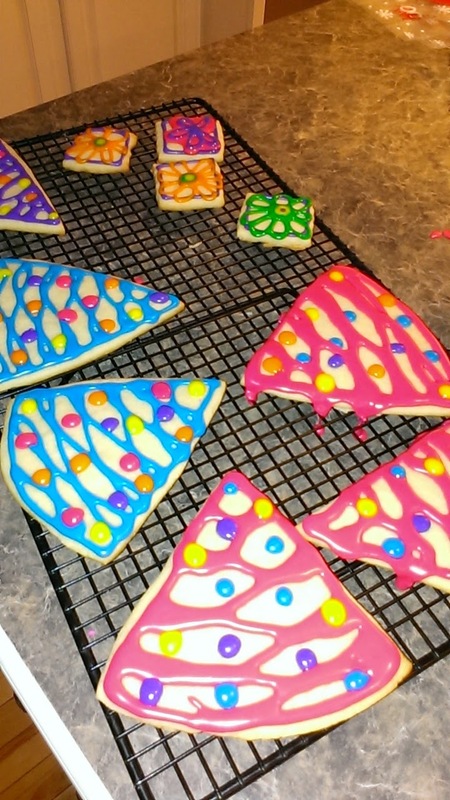 Sugar Cookie Christmas Trees will be in the kids treat bags when they go home this evening. 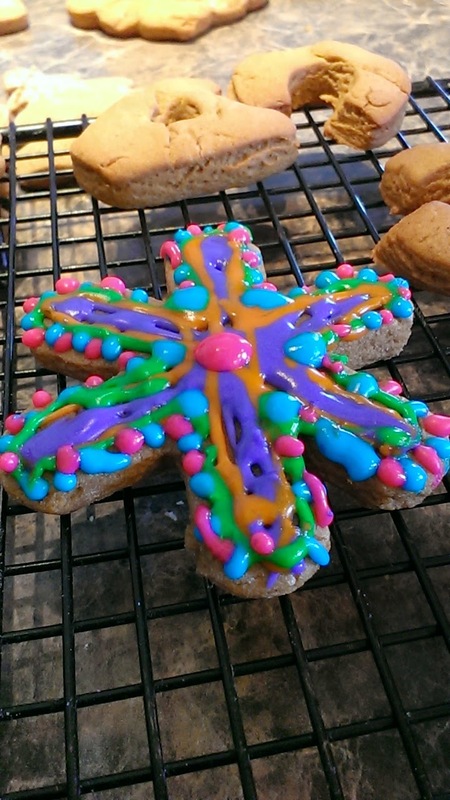 I made these all by myself. I'll see you in the New Year from our home away from home!! Seems like I've been sewing like mad for weeks now. 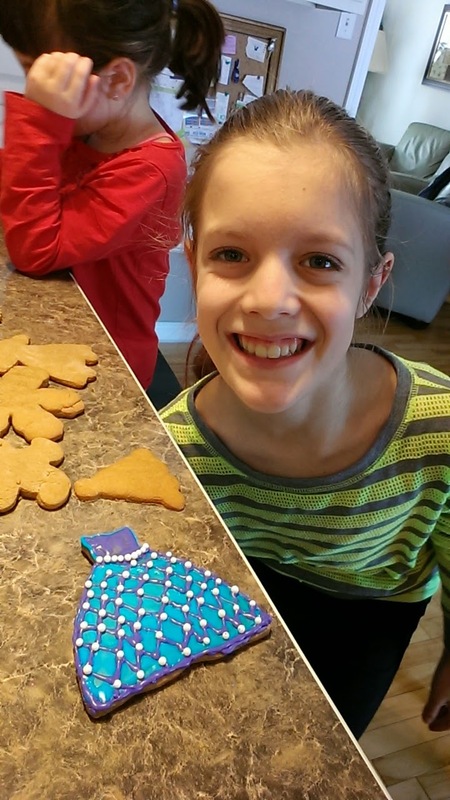 Well, it's all coming to an end as Christmas approaches and we prepare to head south. I had Caitlin and Grace here on Sunday. 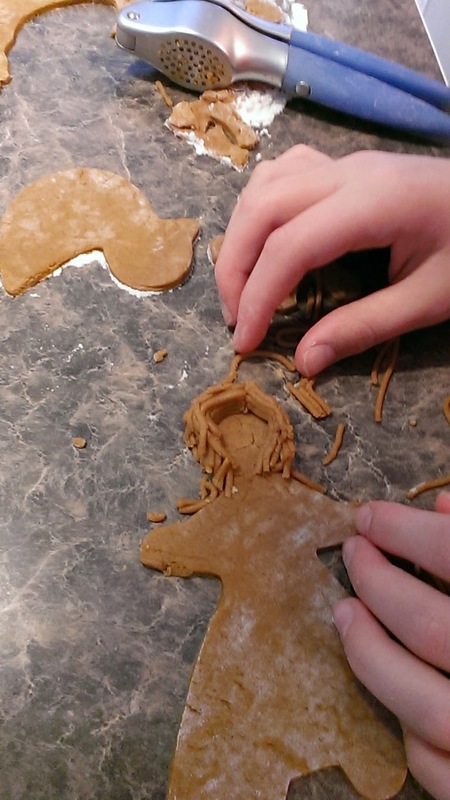 We were doing some Christmas gift making. 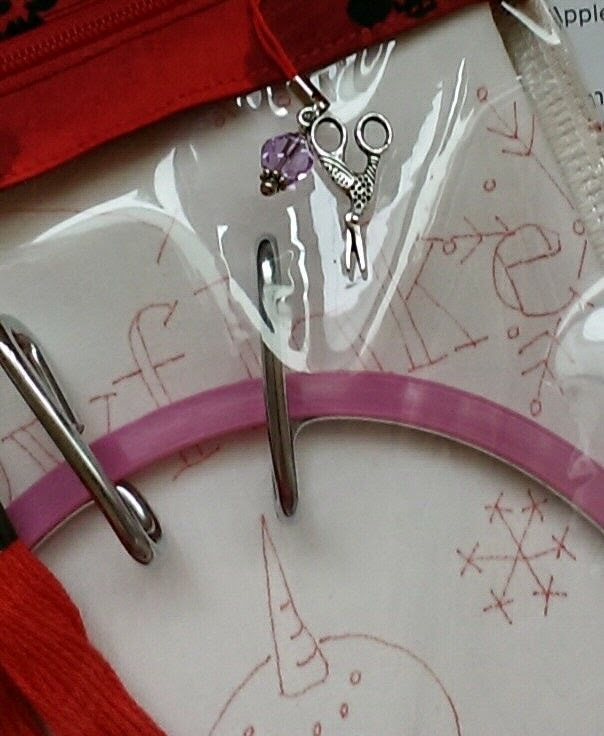 We took a break and the girls helped me search in my sewing room for two missing button hole cutters. 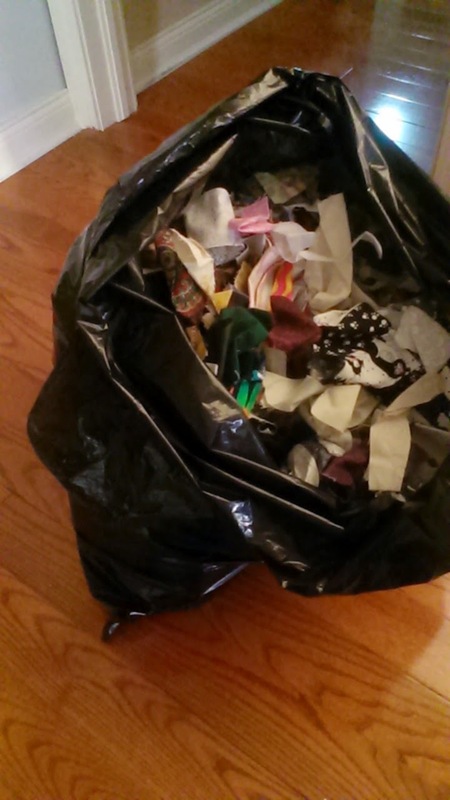 In looking for the cutters, we pulled out some bags of scraps that I had under the sewing table. 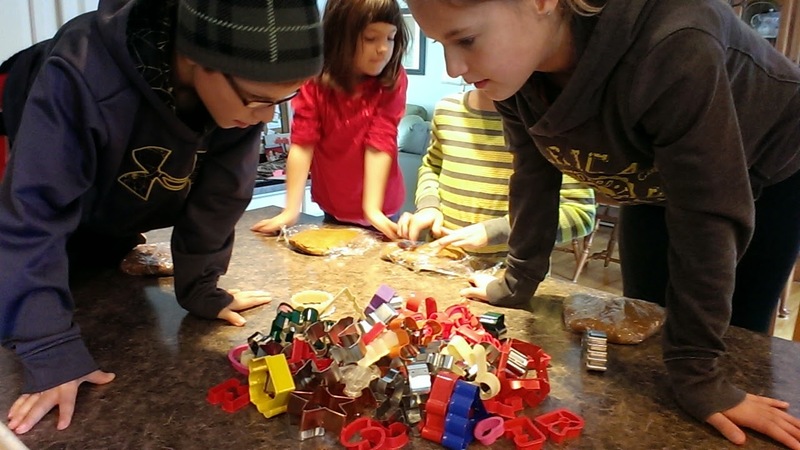 I was all excited after our last FQG meeting, where we talked about organizing and preparing scraps, but today, in pulling out my bags of scraps, that it's too overwhelming. I thought, it's time. Caitlin and Grace poured through the scraps and took a whole bunch home, and here are the rest. Out they go. Today is Garbage Day!!! It's going to a fresh start tomorrow. And I'm glad to have my the space under my sewing desk back. 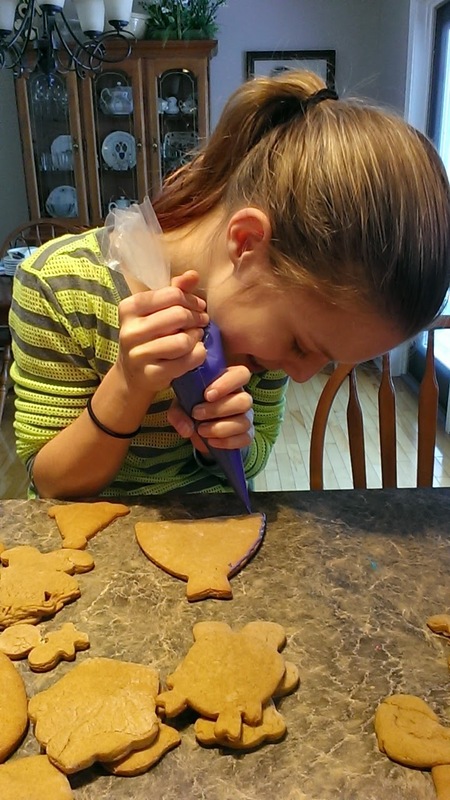 We didn't find my button hole cutters. The search continues. Don't you just love getting an unexpected gift. 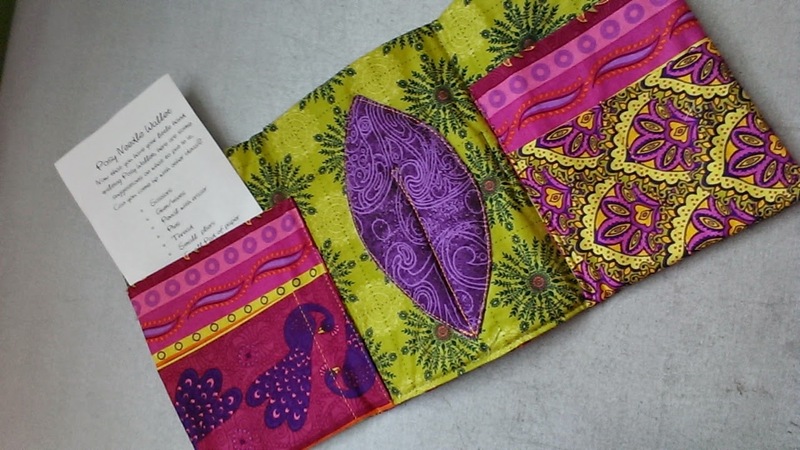 I dropped into a sewing day at a nearby church where some girls were finishing up their wallets from a class that I taught a week ago. We had just too many in the class and these few girls were so close to being done. I dropped in to help guide them through the last few steps. Voila, they had their wallets done in no time. Just before I left, they gave me this gift for dropping by to help them out. 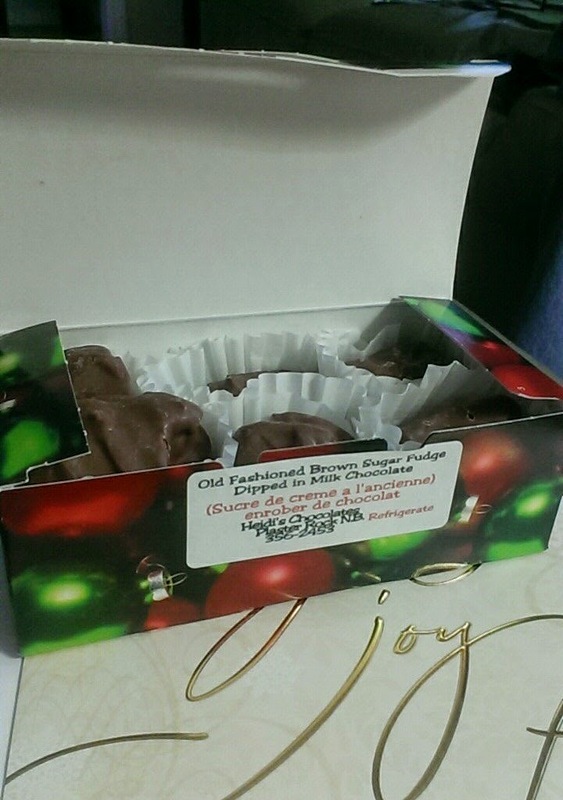 It's a box of Heidi's hand-crafted home made fudge that was hand dipped in milk chocolate. Oh my, it was the smoothest and most delicate fudge ever. Have you had it? It's available at this time of year at craft shows and the market. 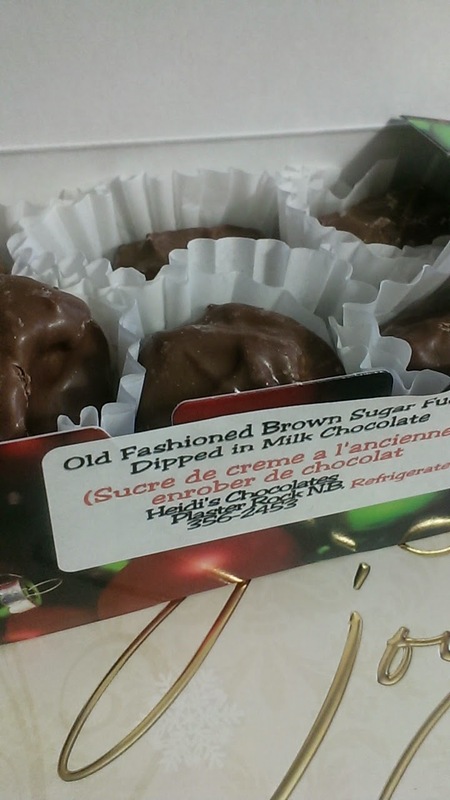 Heidi's fudge is on the "New Brunswick's Fine hand-crafted Gifts list". Well, thank you girls. 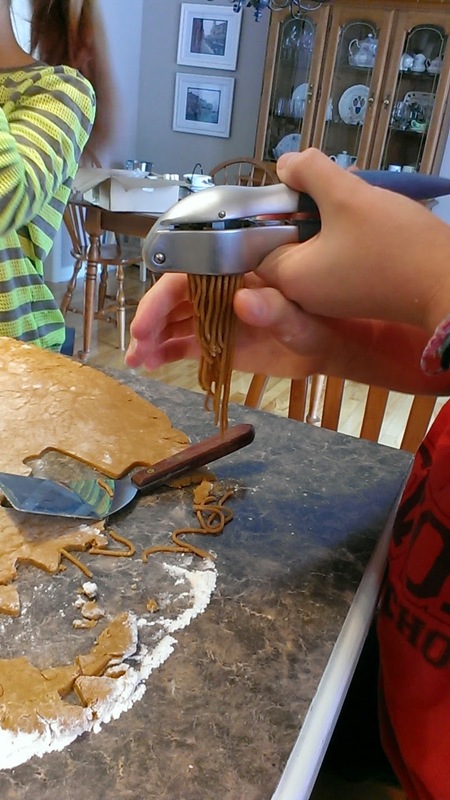 The fudge is gone now, as I write this. My husband and I enjoyed every last morsel. 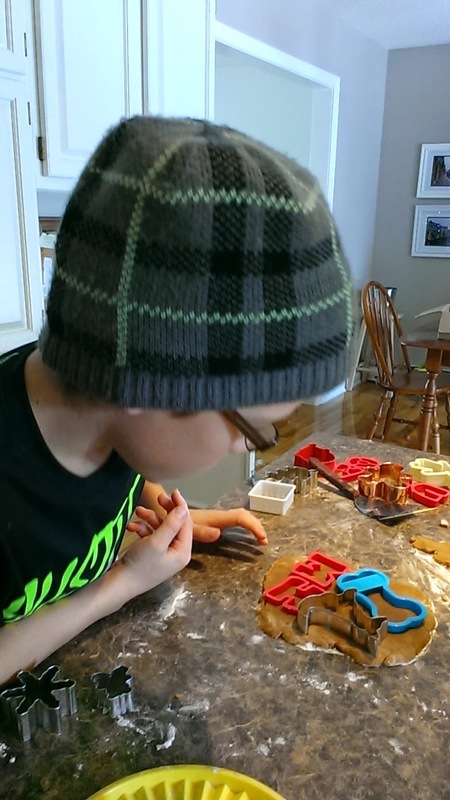 Grampie started off the gingerbread making this past Sunday by suggesting that the one who guessed the right number of cookie cutters in the box would get $5.00. He dumped the box out and the kids had 1 minute to look, but no touching. Mitchell and Caitlin are on top of the island trying to count!!! In the end there was over 75 cutters. And of course, all the kids won $5.00 each. I like how Mitchell is so efficiently using all the dough! It's Aurora's her third or fourth year. She is getting better and better every year. 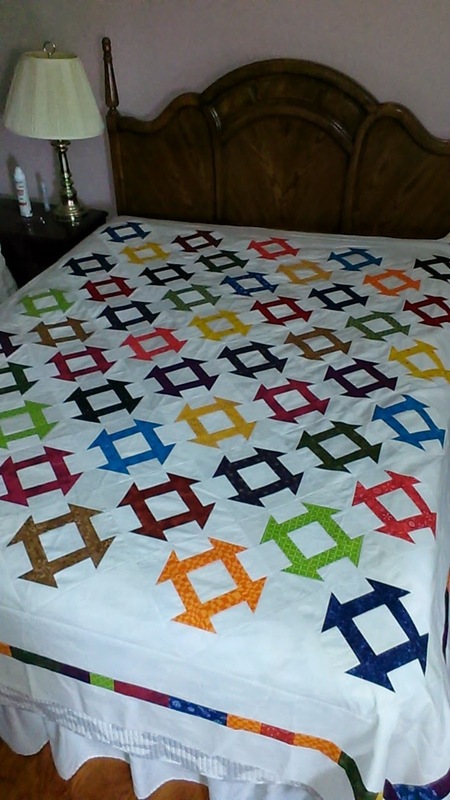 As you know, I've been working on this queen size churn dash quilt since the beginning of November. I started out by pouring through my fabrics to get some nice colors.... Some of the fabrics have music notes, some have stars, like Christmas stars and while none are solids, they look like solids from a few feet away. Since many of the fabrics could be church related, I've been calling this the Church Dash quilt. I had half a mind to stitch Church Dash on the label, but I have a feeling that the girls wouldn't get my humor..., so it'll just be called Churn Dash. I chose to put it in an on-point setting for added interest. There are three borders. The first is white, then a strip of colors, then white again. It will have a nice red binding, to match one of the reds in the quilt. I've had this quilt done for a week now and I'll be handing it over to the St. Dunstan's Quilters this Thursday. I know they will love it since it's quite traditional, yet the on-point setting will make it interesting. They will do their marvelous hand quilting on it over the winter. Miss Aurora was here for a visit over the weekend. On Saturday, she was telling me all about school. 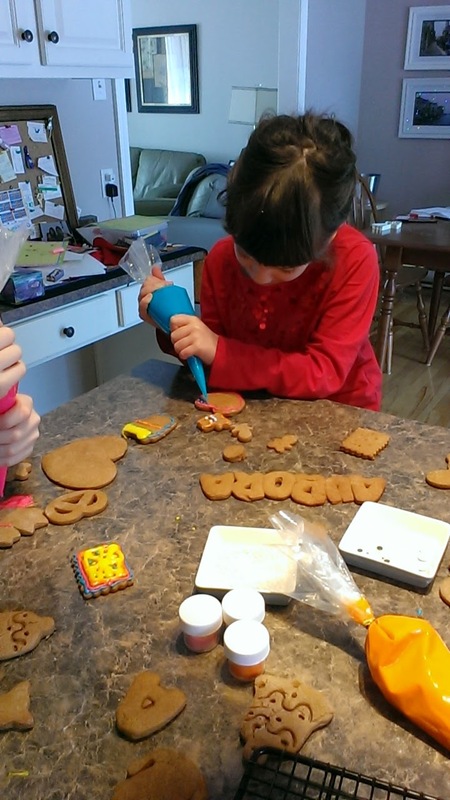 Grade 1 is so much fun and her teacher Mme Lucille is so nice and pays lots of attention to her. 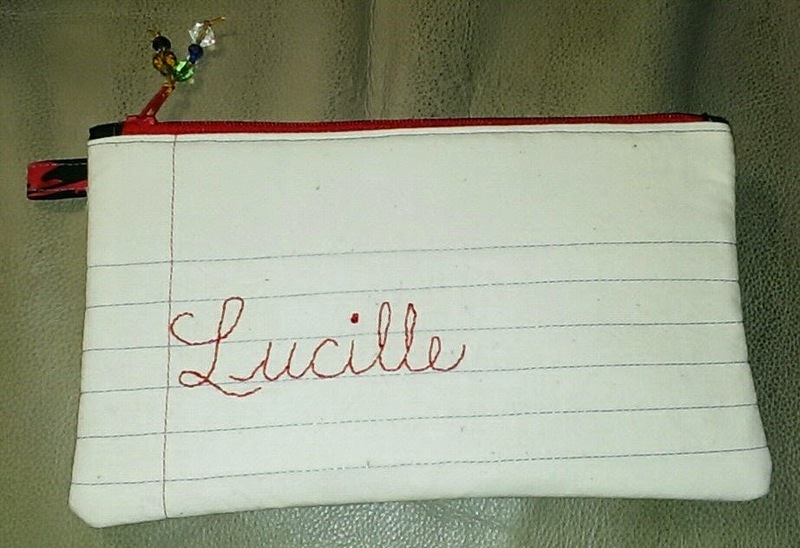 She told me that Mme Lucille loves her pencil case and Aurora really wanted to make one for her. So we set out on our mission for the afternoon. 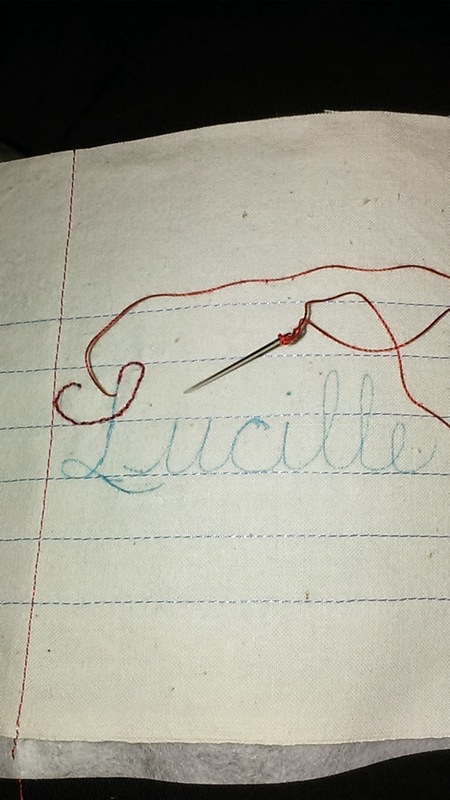 It helped that I had some pre-stitched fabric that looked like paper. 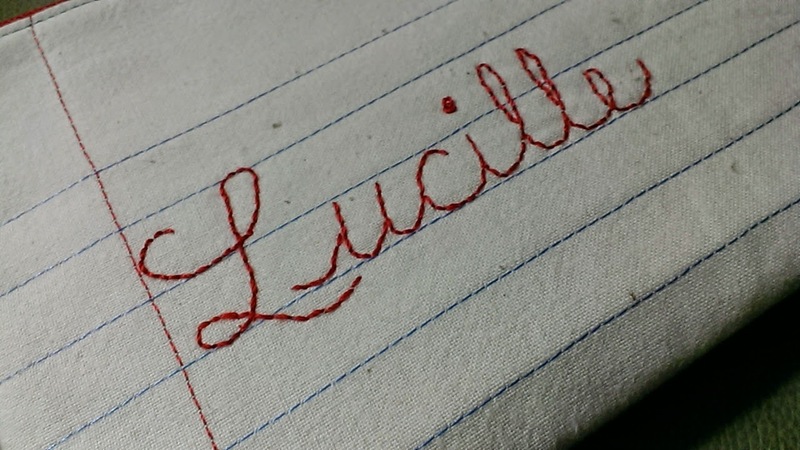 I hand stitched Lucille's name using a cursive font. They used to teach that font in school. 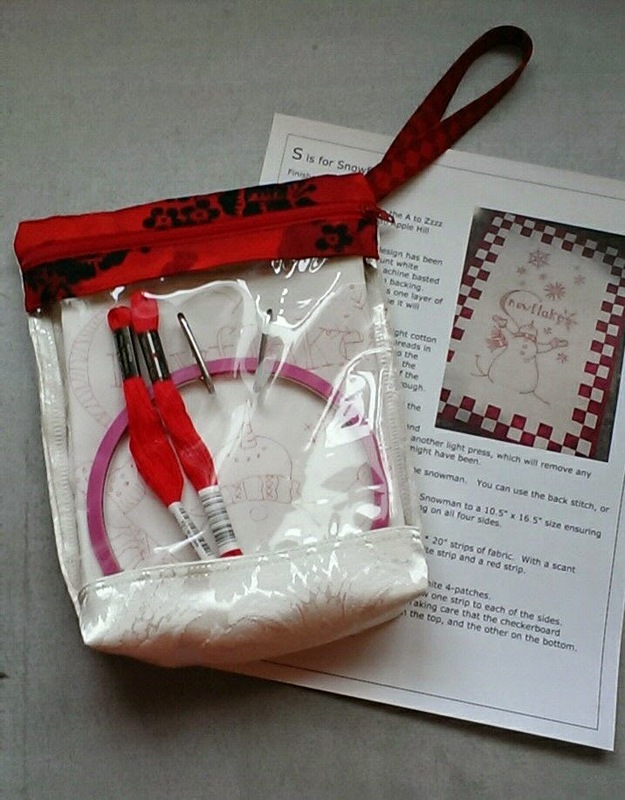 I then I quickly sewed up the the little zippered pouch. Aurora helped by picking out the beads for the zipper pull. She knows Mme Lucille's favorite colors. 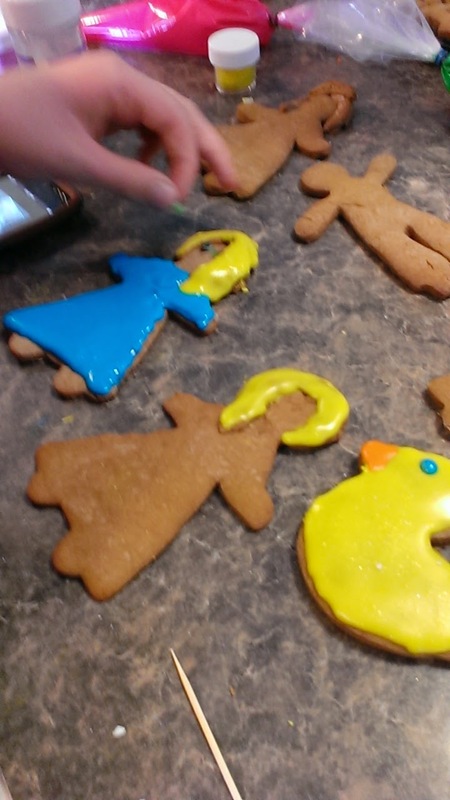 Well, our guild's silent auction and pot-luck luncheon is tomorrow. I'm bringing a guest to our meeting. I'm excited about that because Willa is a quilter and will love to socialize with the other quilters. Anyway, don't you think this would be a perfect gift for a hockey mom or dad. 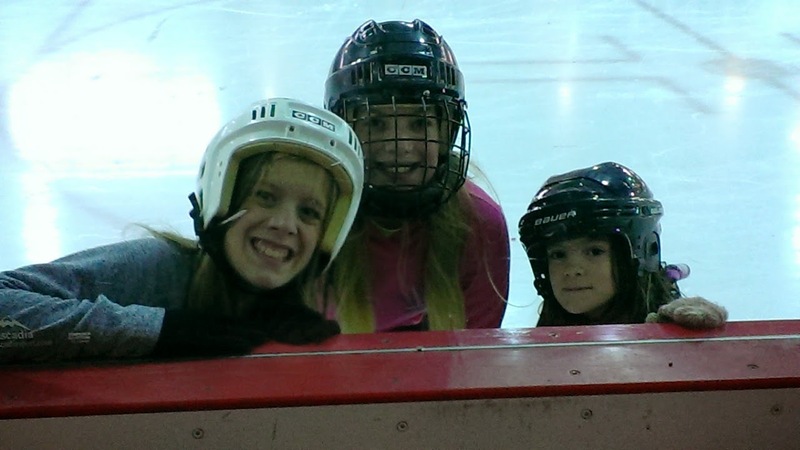 When I walk at the rink on the weekends, there are so many parents there watching the kids. 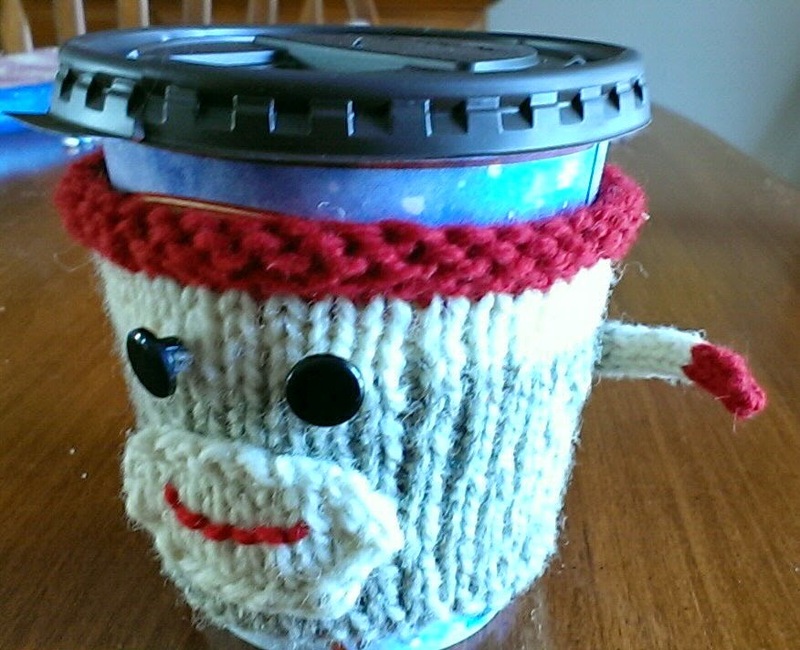 And most are drinking a nice cup of Tim's coffee to keep them warm. That's it folks. Maybe I'll see you at the guild meeting tomorrow. Can you ever be too organized? 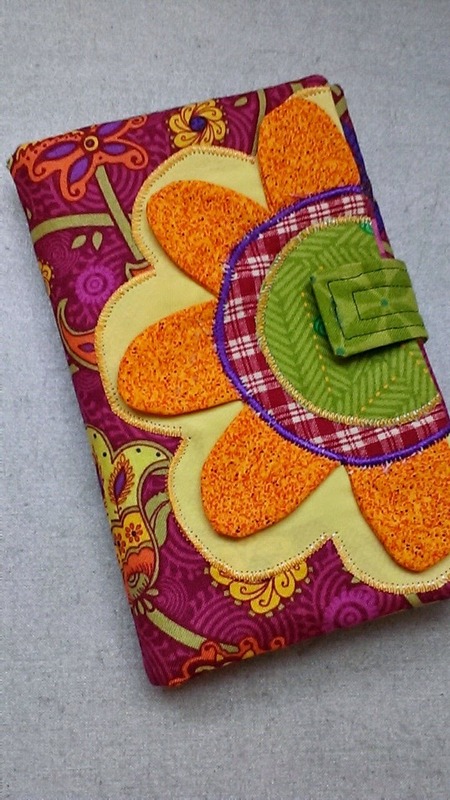 I just love this portfolio envelope style quilted case. It fits a letter sized file folder perfectly. I have one that I carry all my guild notes and papers in. Besides a zipper opening, it has a front pocket with a velcro close and sports a nice wristlet handle with a lobster clip. 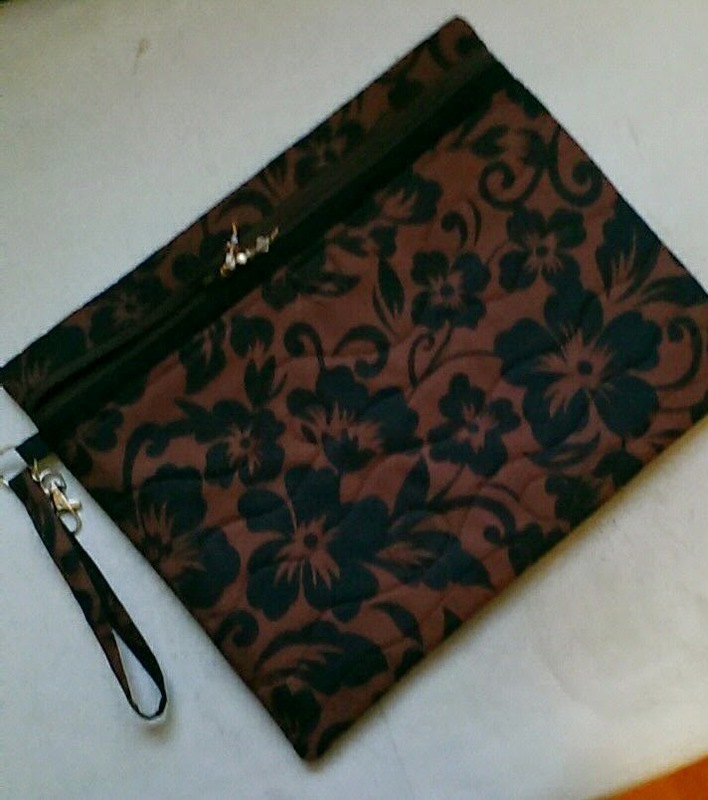 I really like the brown black floral design. Come back tomorrow evening to see the last post of the gifty things for our guild.. I made this smart wallet a couple of weeks ago. I had promised to put a wallet into the silent auction because not everyone was able to take my wallet class this week. I know that there will be somebody who would just love to get this for a daughter grand-daughter. 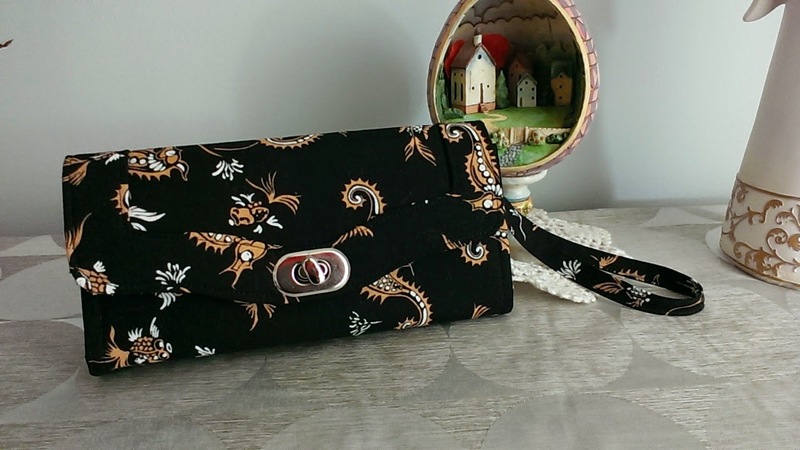 I normally make them out of batiks, but I couldn't resist this sweet seahorse fabric. Whew, it's been a busy week, but come back tomorrow for Day 7. With the inclement weather yesterday, we decided to stay put. No walking, shopping or errands. 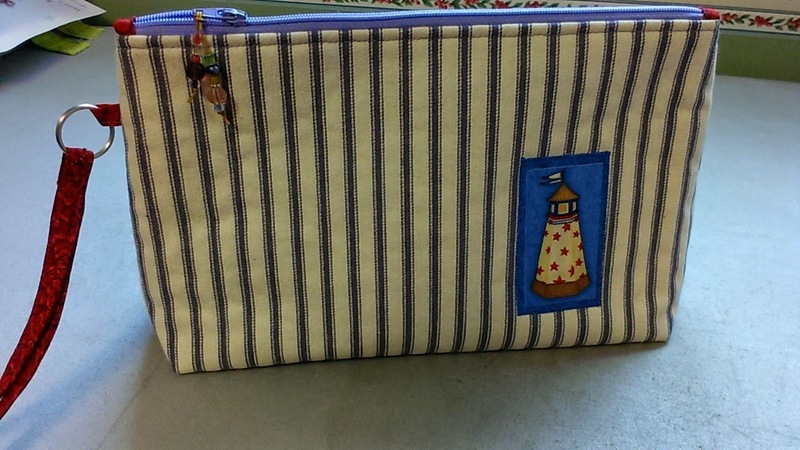 That means lots of time for finishing up this little seaside bag with a lighthouse appliqued on. It's made from sturdy ticking. 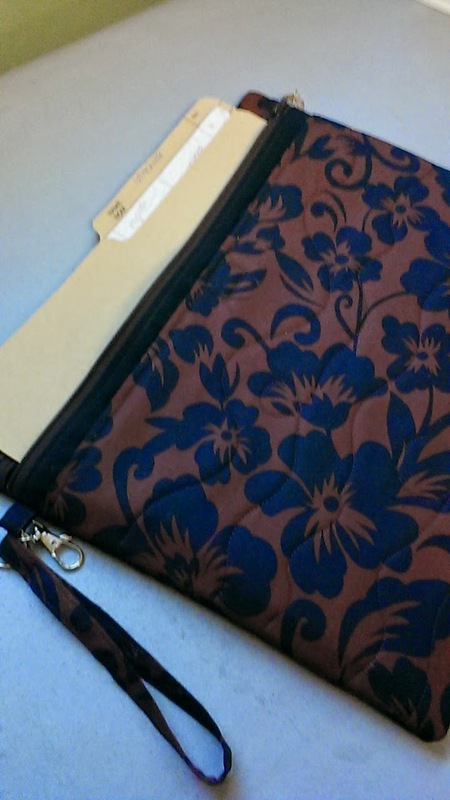 I added machine quilting, but the sturdy fabric doesn't show. Oh well. I still like it. Stay tuned, for day 5 tomorrow. I love wearing a nice scarf in the wintertime. 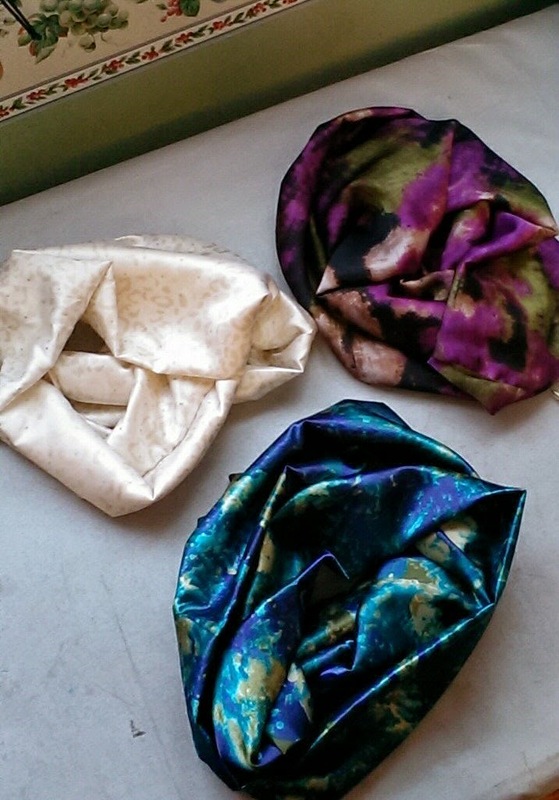 I had these three scarf fabrics in my stash. These loop scarves are so popular, I hope they bring in a good price. Stay tuned for Day 4 tomorrow. I've made countless Posy Wallets. They are usually a hit at the silent auction. I did get a request for this from a couple of members. They'll have to outbid each other since there is only one. This was a pretty easy finish. I have a few of these started and it didn't take long to finish this one. I really should have made two of these, but it's been such a busy day. Stay tuned for tomorrow.